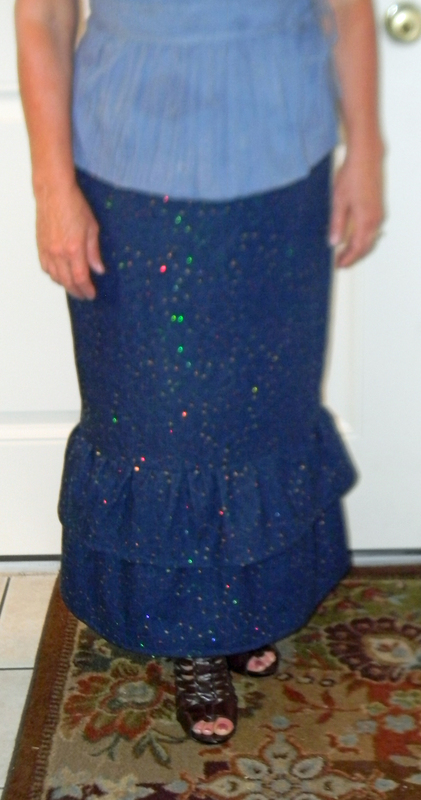 My inspiration for this skirt is from “Beautiful One Modest Apparel” and is called the Elena Denim Ruffle. I have been looking at this skirt for months but is a bit out of what I would like to spend for a skirt, especially since I sew. I pulled out a Simplicity pattern, 9825 and 2 yards of denim (60″ wide) that I have had for months and decided to give it a try. I measured my waist and per the pattern I was a size 8. However, I decided to make a muslin first and glad I did, I RARELY make a muslin. I ended up making a size 12 but took in the hips. On the length I cut 1″ below view B. I then cut a 3″ strip the same size as the bottom of the skirt and added a 9″ slightly ruffled tier at the bottom and a 7″ slightly ruffled tier at the top and then added this piece to the bottom of the skirt. I am under 5′ and this is the perfect length for me. I am pleased with the results and like the pattern. I will be making lots of these skirts, some with ruffles and some without. This entry was posted in Modest clothing, Posts, Sewing and tagged Demin skirt, Modest Skirt, Simplicity 9825. Bookmark the permalink.